No matter which floor plan you choose at Twin Creeks Crossing, you’ll always come home to a comfortable and inviting atmosphere. With the choice of one and two bedroom apartments in Allen, TX, you live a better life at Twin Creeks Crossing. Come home to granite countertops, stainless steel kitchen appliances and glass tile backsplashes in your gourmet-inspired kitchen. 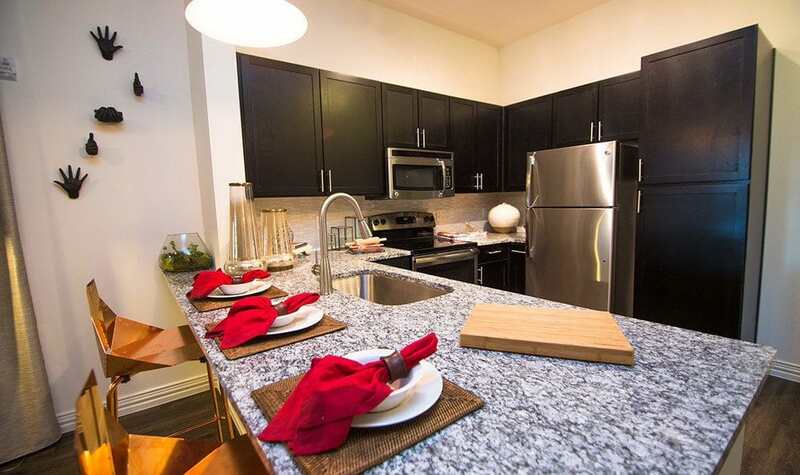 Our luxurious apartment homes also feature built-in desks, an oversized garden tub and spacious, walk-in closets. At Twin Creeks Crossing we know that one size doesn’t fit all. Every person has their own individual taste and style and requires different amenities and functionality. While a balcony or patio off of the kitchen works for some people, others prefer it come off of the living room. It’s the little things that count at Twin Creeks Crossing, which is why we have a variety of floor plans and layouts to choose from. Make your apartment a home, by selecting the layout and amount of space that works for your unique requirements. We offer five different floor plans for our one bedroom apartments, which range from 660 square feet to 856 square feet. Two bedroom apartments range from 1,014 square feet to 1,282 square feet and come in three different floor plans. Whatever your personal preference, we have a layout and floor plan to suit your requirements. Contact us today for more information about our floor plans and availability.